The fact there are just a handful of reliable, well-stocked bookshops in Cairo betrays Egypt rich literary history. While the likes of Diwan have done a fantastic job in filling the void, the internet is full of spoilers long before the biggest fiction titles have arrive on these shores and good luck if you’re looking for a more specialist, obscure book. In 6th of October City, Arkan Mall’s first bookshop comes in the shape of Kelma Araby. Located on the ground floor, the shop is right next to the escalators and stocks philosophy, politics, and Arabic literature books, as well as a few children’s books. Decorated with hardwood floors and wooden racks, the venue is quite small. A little too small perhaps; books are haphazardly piled in random places on the floor. While in theory this gives that very specific charmingly informal vibe, it’s a little too chaotic. Most of the shelves were unlabeled and upon closer inspection we understood why; there was no organization scheme whatsoever. Not even an alphabetical order. Placed in the centre of the store was a wooden counter with various Arabic novels, including a series of Arabic romantic novels by the Algerian writer Ahlam Mustaghanimi such as ‘Fawda Al Hawas’, ‘Aabr Sereer’, and ‘Zaker Al Gasad’, all costing 89LE. The only two shelves with labels were Literature and Politics, which also seemed unarranged. 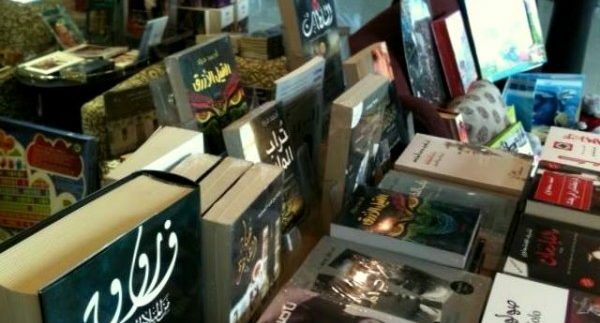 They included books such as ‘Al Marhoom’ by Hassan Kamal (55LE), ‘Torab Al Mass’ by Ahmed Morad (45LE) and a series of political books by Galal Amin ranging up to (89LE). The right side of the store was dedicated to children’s books, crammed with colouring books, school notebooks and a few English-language fiction titles ranging from between 20LE and 50LE, including ‘Diary of a Wimpy Kid’ (89LE) suitable, ‘Heroes of Olympus’ (109LE) and a few copies of bed time stories, including ‘Finding Neverland’, ‘Finding Nemo’ and ‘Thumbalina’ (25LE- 39LE). Overall, despite it being useful for only very specific types of books, Kelma Araby is likely to be the successful Hail Mary last attempt for bookworms looking for something specific. Stay up-to-date with Kelma Araby's newest stock on the shop's official Facebook page. Kelma Araby is likely to have more obscure titles. Browsing is no easy task.